Flat roof decks, a real crowd pleaser. Flat roof decks are a great way to maximize open living space, not to mention the fantastic views. Weather permitting, you can entertain on a roof deck or just spend time watching the stars at night. Decking systems add significant resale value to a home, but only if constructed correctly. The damage and stress that an incorrectly drained roof deck can cause are severe and will threaten the whole home if allowed to go unrepaired. No matter how you decide to drain your roof deck, it has to be done in the planning stages. You can use the best waterproofing membrane manufactured, like Pli-Dek, but if all the water has no place to go, the water will pool and eventually destroy the waterproof membrane. Since you are dealing with a roof deck, water damage creeps into the rooms below, creating havoc for sub-frame structures and anything else beneath it. The best-case scenario is that you catch the problem before it gets into the rooms beneath so you only have to rip out the roof deck and start again. The worst-case scenario is much more involved, you might even have to move out of your home while repairs are being conducted. Both “scenarios” are expensive and time-consuming. Whether you decide to slope your roof deck toward the middle of the structure or to the outer edges, make sure it is included in your plans for the house and the roof deck. You should not leave this to chance, or assume the builder knows to create proper drainage. Sit with a contractor and draw up a plan that spells out how the roof deck is drained. Make sure anyone bidding on the job is aware of the drainage component. A tip? If a contractor knows nothing about building a roof deck, he will probably not care if it is in the plans. That’s a contractor you don’t want. Some general rules about roof deck drainage. Depending on the size of the roof deck, you will want it to drain toward the middle, or to the edges. If your roof deck is large enough, you want to create slope drainage from two sides toward the middle. Why? Because the distance involved creates a situation where one drainage plane cannot be maintained without altering the substructure. You only have so much slope between points A and B, you have to use what you have to create the correct drainage. With a smaller roof deck, you can get away with a single drainage slope. Keep in mind that these are general rules of deck drainage, some projects are complex and have multiple drainage planes that have to be implemented. As stated before, a competent contractor or designer understands all of this and incorporates it correctly. This is not a construction project geared toward amateurs. 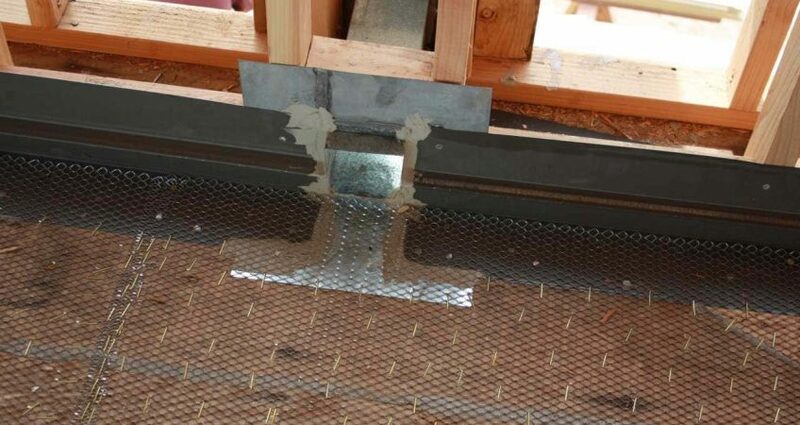 Roof deck systems are tricky to build and install correctly. The substructure, waterproof membranes, and deck surfacing have to interact with one another in order for the deck to function. Your best bet is to get with experts in the field, have them design and build the roof deck to your specifications. The damage that comes from an incorrectly drained roof deck system can cripple your finances and your ability to live in your home. When designed and built properly the first time, you are guaranteed many years of enjoyment with your roof deck. At Pli-Dek we understand flat roof systems and how to drain them. When you want to learn more about roof decks, please contact us.